The pair face attempted grand larceny charges after they try to scam a Minnesota woman out of nearly $8,000 in cash and gift cards - some of which was mailed to a Roosevelt address, police said. Two Queens residents face attempted grand larceny charges after they tried to scam a Minnesota woman out of nearly $8,000 in cash and gift cards — some of which was to be sent to an address in Roosevelt to help her supposedly imprisoned grandson, authorities said. The female victim, 84, of Goodhue, Minnesota, said she received a phone call on April 3 from a person who identified themselves as an attorney, stating falsely that the woman's grandson was in police custody, Nassau cops said in a news release. The caller then directed the victim to purchase gift cards totaling about $2,750 and to provide those codes over the phone, police said. The victim complied. Two days later, the caller contacted the victim again and told her to send $5,100 in cash to an address on Hudson Avenue in Roosevelt to get her grandson into a work release program, authorities said. The victim went to a Minnesota UPS store where a store employee instructed the victim to contact police before mailing out the package, authorities said. The victim called the Goodhue Police Department, which then conducted a joint operation with Nassau police, officials said. The victim agreed to mail the $5,100 and on Monday, shortly before 11:40 a.m., detectives apprehended Jiarui Chen, 25, of Queens as he arrived at the Roosevelt location to remove the package, police said. Police then found Chen's vehicle, a 2014 Mercedes-Benz, and arrested his wife, Yue Niu, 26, of Queens, who was sitting inside. The vehicle was impounded. 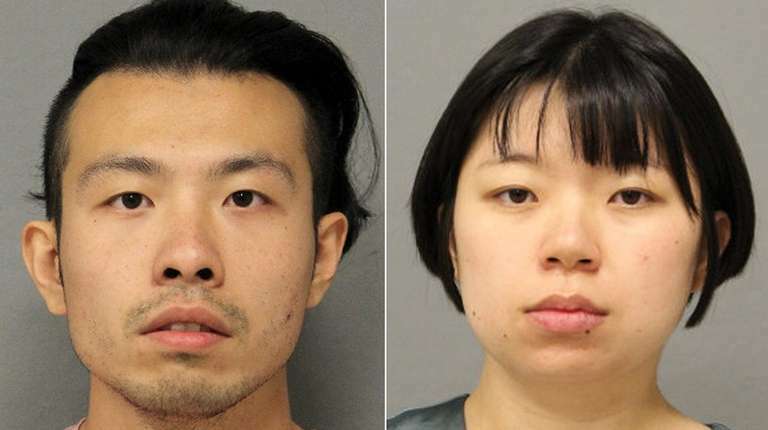 Chen and Niu were each charged with third-degree attempted grand larceny. Chen was arraigned Tuesday in Hempstead and held on $2,000 cash or $1,000 bond. He is due back in court Thursday. Wei Zhu, an attorney for Chen, did not immediately respond to a request for comment. Niu was issued a desk appearance ticket and is due back in court May 13. In recent months, Nassau and Suffolk police have issued warnings to seniors to be on the alert for con artists who have stolen tens of thousands of dollars by claiming to be police officers, IRS agents and other government officials. The swindlers typically call victims and tell them they need to send money to bail out loved ones from jail or to settle an outstanding tax bill or legal issue, according to police in Nassau and Suffolk counties. Law enforcement officials said these were especially tough cases to investigate and prosecute because the scam artists are often based in Russia, China and other foreign countries. Nassau detectives ask anyone who has been victimized by Chen or Niu to contact police at 800-244-TIPS. All calls will remain anonymous.